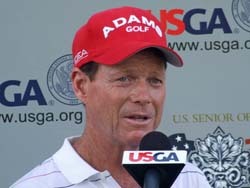 For the second year in a row, Tom Watson (pictured) held a lead going into the final day of the U.S. Senior Open , only to see it disappear. Last year, it was Allen Doyle who came from 9 shots back to unseat Watson from the top of the leaderboard and win the championship. This year, it was little known Brad Bryant that started the day 5-shots back and ended up winning by 3. Watson led after the last two rounds and seemed destined to win his 1st U.S. Senior Open title. He went through the first 10 holes like it was a done deal. Then the wheel fell off the cart. Watson shot a final round 6 over par 78, falling all the way to just 1-under par and a 4th place finish. In all, Watson has eight major titles along with 37 PGA Tour titles. He&apos;s also won 9 Champions Tour events, but the U.S. Senior Open eludes him for another year. There&apos;s always next year. The East Course at the Broadmoor in Colorado Springs, Colorado will host the event in 2008 from July 31 to August 3.